Night can transform an ordinary scene into something magical. Light, shadow, texture, tonality, pattern all work together to create a very different composition compared to photos captured during the day. Night has it's own magic. 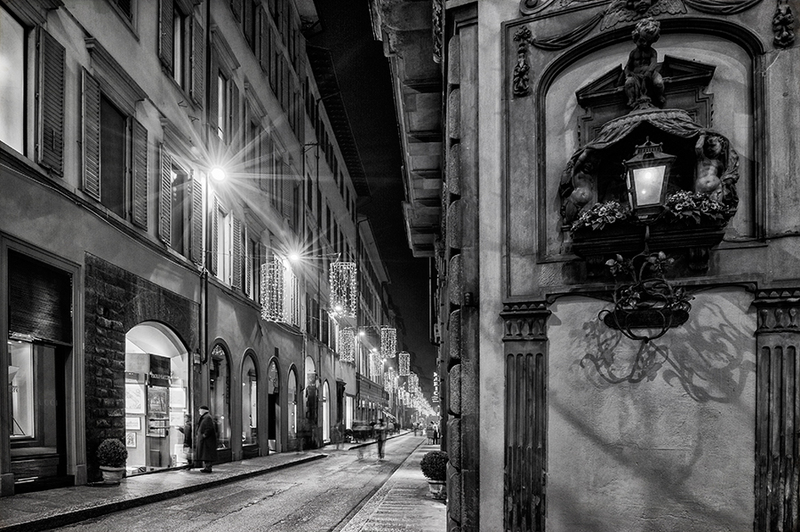 I loved walking the streets of Florence, Italy at night, everything was a picture. The camera used to make this photo was a Nikon D3s, and Nikon 24-70mm lens, one of my favorite lenses. I carry a Feisol 3442 carbon fiber tripod, and F-stop Loka camera bag which is organized, rugged, and awesome. I'm very excited about a new messenger style bag from F-stop that I plan to carry for cityscape photography. It's called the Ando, and I'll post more about this very soon! Nik Silver was used to convert this image to black and white. I like to expand on the presets, especially High Structure or Full Dynamic to create an image with drama and impact.